1 tablespoon or so of freeze dried blueberries (freeze dried over fresh will give you nice color, a powder that will easily break down instead of blueberry pieces that might not wash away or down the drain well and will not need refrigeration. But fresh is certainly an option if you have them on hand and will be enjoying this right away). Start by breaking down the freeze dried blueberries. You can do this by smashing them with your fingers or using the food processor. Once you have that part taken care of, add the sugar, coconut oil, essential oil and option food coloring. Mix until well combined. If using the food coloring, you may need to pay a little extra attention to make sure the color is evening mixed in. Optional, if you have fresh lemon, you could zest 1 small lemon onto a tray or oven safe dish and then dry it by placing it in the oven at 350 degrees for a few minutes. You’ll know it’s ready when you start to smell a robust lemon scent coming from the oven. Stay close, this only takes a few minutes. Its certainly an extra step but would be so pretty mixed in with the blue! 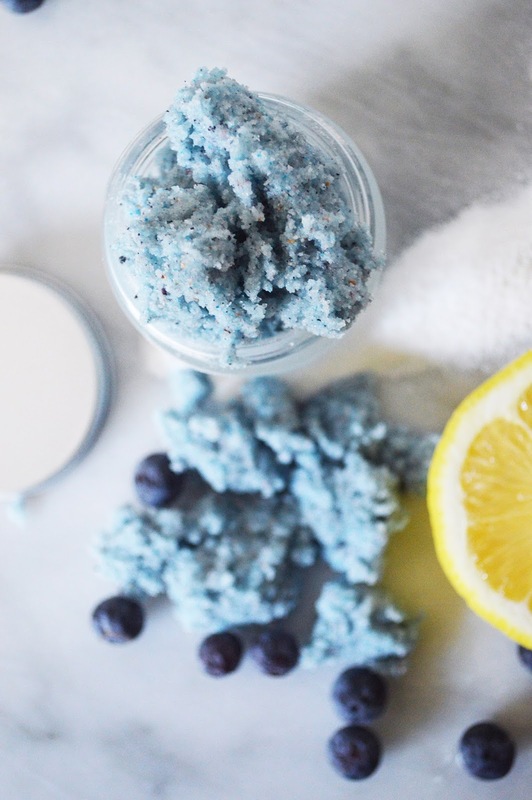 Like using fresh blueberries, you could certainly use fresh lemon zest if you plan to use this within a week or so, you might just want to keep it refrigerated if you go fresh. Store in an airtight container and take a little extra care when using as the coconut oil will make surfaces seem slicker. I typically apply a scrub like this as the last thing I do in the shower, then rinse off and pat dry with a towel to leave as much of the coconut oil on as it is very moisturizing for your skin.